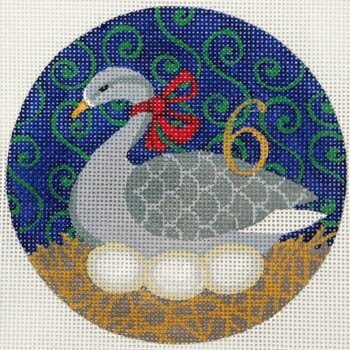 6 Geese a Laying is a beautiful addition to your traditional Christmas ornament collection. This series is by JulieMar Needlepoint. The design is hand painted onto 18 mesh canvas and measures 4.5" in diameter. If you select threads we will send DMC cotton floss or Planet Earth Pepperpot silks. If you choose mixed threads we will add glisten and kreinik to your selection. Make your selection from the drop down menu. This canvas is suitable for an intermediate stitcher. If you want to hold the canvas taut on stretcher bars while you stitch it we recommend two pair of 8" and some thumb tacks. Find instructions on how to finish this design as a needlepoint ornament. Contact us with any questions as we're always happy to help and we try to respond within a few hours. Helenz Bag 10" x 7"